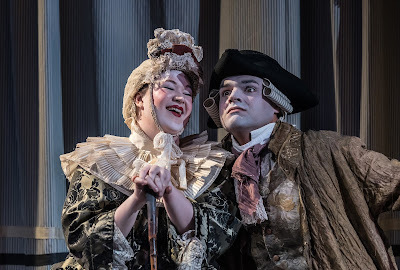 English Eccentrics – British Youth Opera at the Peacock Theatre. Edward Hughes (Beau Brummell) and Kieran Rayner (Etienne). For its second opera as part of the season at the Peacock Theatre, British Youth Opera hit upon a real rarity, Malcolm Williamson's 1964 opera English Eccentrics with a libretto by Geoffrey Dunn based on the book by Edith Sitwell. Directed by Stuart Barker with Victoria Newlyn as movement director, and sets by James Cotterill, costumes by Laura Jane Stanfield and lighting by David Howe, the cast featured Iuno Connolly, Polly Leech, David Horton, Edward Hughes, Kieran Rayner, Matthew Buswell, Maria McGrann, Sian Griffiths, Steven Swindells and William Thomas. Peter Robinson conducted with members of the Southbank Sinfonia in the pit. Malcolm Williamson (1931-2003) was born in Australia, studying at the Sydney Conservatorium of Music with Eugene Goosens and moving to London in the 1950s where he studied with Elizabeth Lutyens and Erwin Stein. His jobs at this time included that of organist, proof-reader and cabaret pianist, a combination which perhaps is reflected in the eclecticism of his music. 'Eccentricity', wrote Edith Sitwell, 'exists particularly in the English, and partly, I think, because of that peculiar and satisfactory knowledge of infallibility that is the hallmark and birthright of the British nation.' Her book, technically a work of non-fiction but highly poetic in its language, was published in 1933. English Eccentrics was Williamson's second opera, written in 1964 (it was preceded in 1963 by Our Man in Havana). The opera was written for the Aldburgh Festival and performed in the Jubilee Hall, as such it was always intended as more of an entertainment (Peter Pears described it as something of an 'anti-opera'). Edward Greenfield in his 1964 review of the opera in Tempo describes it as being akin to a sophisticated game of charades. Dunn's libretto resents us with a whole galaxy of 18th century eccentrics. There are 39 named characters played by just six singers (Iuno Connolly, Polly Leech, David Horton, Edward Hughes, Kieran Rayner, Matthew Buswell) along with a quartet (Maria McGrann, Sian Griffiths, Steven Swindells, William Thomas) which narrates, links and comments. Essentially a sequence of disparate scenes involving a wide variety of eccentric characters, Dunn weaves the stories together to provide an engaging world full of strong colours. Sometimes characters were on stage for just a short moment, but others were more developed such as Sarah Whitehead (Iuno Connolly) who goes mad when her brother is executed for turning to crime in order to support her spending habits. Some characters were laugh out loud funny, others were simply crazy like Lord Rokeby (Kieran Rayner wearing nothing but a bunch of bubbles) who spends all his time in the bath. The ending was surprisingly poignant as Beau Brummell (Edward Hughes), whom we had seen earlier being fawned upon by two ladies, is now in a mad house and the song of the two nuns (Iuno Connolly and Polly Leech) formed a surprisingly peaceful and evocative end to the piece. Williamson's music for the piece is highly eclectic. Using only an ensemble of only seven players, violin (Scott Lowry), cello (Zoe Saubat), clarinet (Jordi Juan Perez), bassoon (Barosz Kwasecki), trumpet (etty wake), percussion (Tom Lee) and piano (Joe Howson), the result was a highly transparent texture, intended to allow the voices and, crucially, the text to come forward. Polly Leech (The Countess of Desmond) and Matthew Buswell (Thomas Parr). 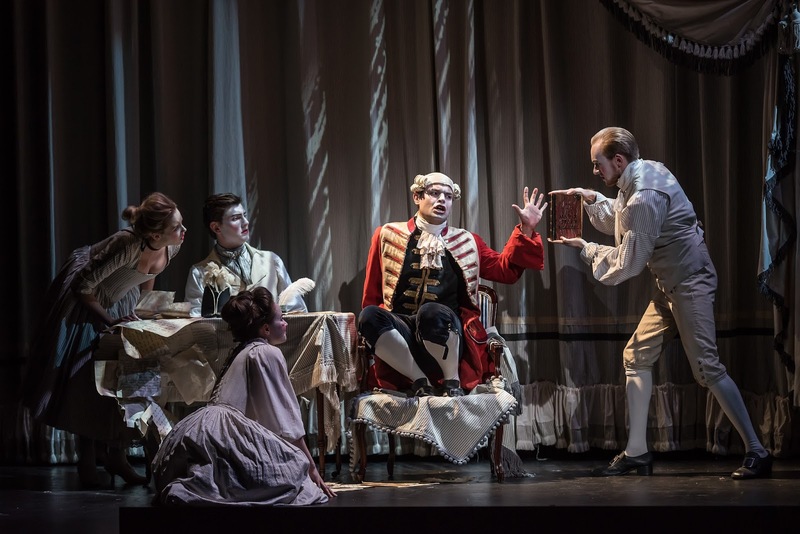 Though there were plenty of nods to 18th century style in minuets and other moments, there were more modern elements to the music too, including items which seemed to come directly from Broadway. So the two ancients, Thomas Parr (Matthew Buswell) and the Countess of Desmond (Polly Leech), had an amazing dance number (not bad for characters whose combined age was supposed to be 280! ), and Romeo Coates (David Horton) serenaded his Juliet, Miss Fitzhenry (Polly Leech) in Gershwin-like tones. Stuart Barker's production was fluid and full of lovely touches, using curtains to screen sections of the stage so the work flowed beautifully from scene to scene. Laura Jane Stanfield's neo-18th century costumes were highly imaginative and sometimes spectacular, with a striking use of ticking for all sorts of things including the striking mock 18th century wigs. The problem was that the different characters floated past at such a rate that it was sometimes bewildering to work out who they were, though Williamson's imaginative music included some deft characterisation. The work seemed to settle into its style with longer, more developed episodes. The young cast worked hard and created just the right atmosphere, admirably slipping from character to character, musical style to musical style. One problem was that the projection of the text was patchy so that crucial sections of the text did not come over (a permanent grip of mine with performances at the Peacock Theatre). But over all I was impressed with the combination of energy, style and wit in the performance so that the two hours sped by delightfully. English Eccentrics may be a mad piece, as eccentric as its name, but the young performers ensured that we went home delighted. The singers were ably supported by the instrumental septet which entered into the eclectic spirit of the piece with a will, presided over capably by Peter Robinson. Malcolm Williamson's operas (and there are ten of them) are still unfairly neglected. 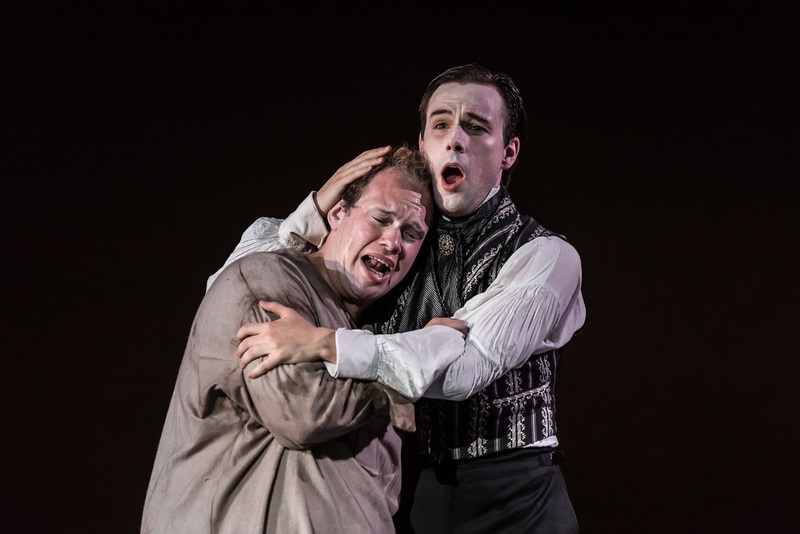 I must commend British Youth Opera for its imagination and daring in their selection, and sheer verve in their execution. English Eccentrics remains, however, something of a curiosity albeit a delightful one, and I cannot help wishing that The Violins of St Jacques had been chosen.